Oriana is a highly decorated chef, having received many accolades over the years. She was the first woman in the world to win the Pizza World Championship in 1994 in Las Vegas. Oriana was born in San Benedetto del Tronto, Italy, a famous beach resort and fishing harbor facing the Adriatic sea. Her grandmother and entire family were involved in the food catering business. She started her career as the head chef and owner of a restaurant in Ascoli Piceno province in 1986, and her talents as a restaurant consultant have led over 240 restaurants in Italy, Germany and Hong Kong to success. 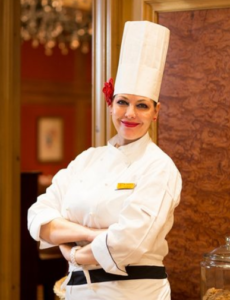 Since 2008, Oriana has spread her wings and worked as an Italian cuisine chef in many five star hotels around the world, such as Mezzo Mezzo at JW Marriott Hotel in India, Mumbai, Rosso at Shangri-La Hotel, Indonesia, Jakarta, Spasso Restaurant and Bar 494 at Erawan Grand Hyatt Bangkok in Thailand, Bangkok.